WILLEMSTAD - The entrance staircase to Fort Beekenburg is open again. 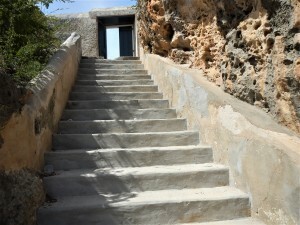 The restoration of the old staircase was carried out by the Maritime Archeology Curaçao Foundation. Due to the poor condition of the stairs, visitors could stumble across the separate staircase sections and the large holes in the two platforms. Also, the railing at the bottom part of the stairs was gone. Fort Beekenburg is visited daily by residents of Curaçao and tourists. Because the government, owner of the fort, shows no interest in this beautiful monument and now no longer has money for restoration, the Prins Bernhard Cultural Fund Caribbean Region was prepared to take on the restoration costs.